Steel wire mesh is an extremely versatile material that gives itself to fabrication into an almost limitless range of applications. Not surprisingly, humankind has borrowed this perfect form from the natural world. 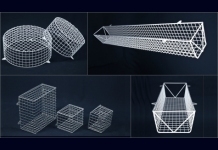 MS Guardio offers a vast world of wire mesh guards suitable for various different purposes. 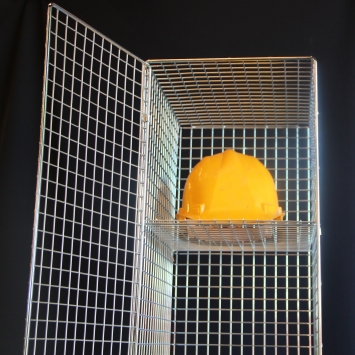 MS Guardio’s world of wire mesh guards are made from two kinds of wire mesh. 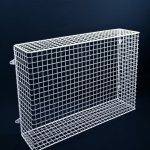 Most of our standard every day radiator guards, light guards and so on are made from steel welded mesh, a light, strong material that is perfect for these applications. We also sell products made from heavier duty hand-woven steel wire mesh for applications as diverse as machine guards and church window guards. For more information please see our article on materials and coatings. 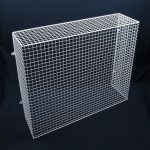 A huge world of wire mesh guards are available from MS Guardio and our experts are always checking and expanding the range of wire mesh grilles, mesh cages and other products available. If you can’t find what you need, please contact us for advice or to quote for a customised guard product. 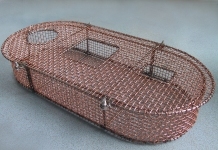 MS Guardio supplies two ranges of tubular heater guard. MS Guardio tube heater guards are available for all the leading tubular heaters including Thermotubes and Dimplex. 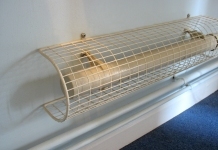 See our tubular heater guard page for more information. MS Guardio heater guards are available for all the leading brands and types of heater and radiator. You can find wire mesh grilles for storage heaters, combination heaters, panel heaters, convector heaters, quartz heaters, ceramic heaters, electric radiators and more. There are grilles for both wall mounted and floor standing heaters. See our radiator guard page for more information. 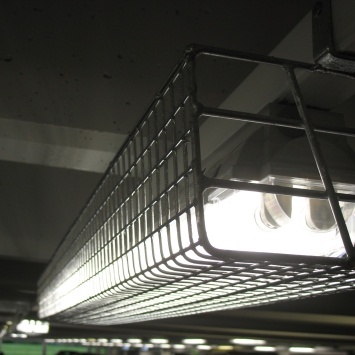 MS Guardio supplies a range of wire mesh cages for fluorescent lights, floodlights, bulkheads, PIR sensors and so on. Wire mesh cages protect sensitive fittings from accidental (and non-accidental) damage and discourage tampering. 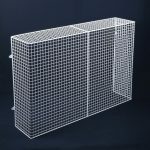 MS Guardio supplies a range of wire mesh lockers in a variety of configurations. 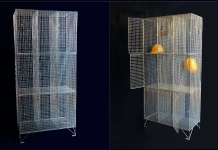 Mesh lockers are used in schools, warehouses, construction sites and so on. Wire mesh security lockers keeps the contents of the compartments visible, discouraging theft and vandalism. The wire mesh locker allows good air circulation, perfect for keeping clothes dry. Excellent ventilation will also help to keep the contents fresh and odour free. MS Guardio sources radiator guards from AIANO, the radiator guard experts, who have been designing and manufacturing radiator guards for as long as they have been required. 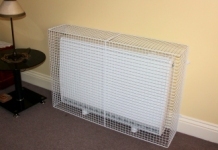 AIANO wire mesh radiator guards are the only radiator guards recommended by the Glen Dimplex Group of companies and featured on the Dimplex website. 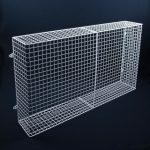 MS Guardio’s world of wire mesh guards also include light guard and sensor guard products suitable for batten fittings, floodlights, bulkhead lights, motion detectors and so on. We continue to add regularly to the choice of standard products on offer, but if you cannot find what you are looking for MS Guardio can supply customised wire guards for all kinds of light fittings. We offer customers a wide choice of coatings, colours, shapes, sizes, specifications and design solutions to find the optimum guard solution for your specific environment, requirement and budget. 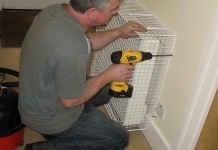 MS Guardio can organise site services on request, including measuring up radiator guards and fitting the guards. MS Guardio can supply customised solutions for a wide range of products from projector guards to machine guards.